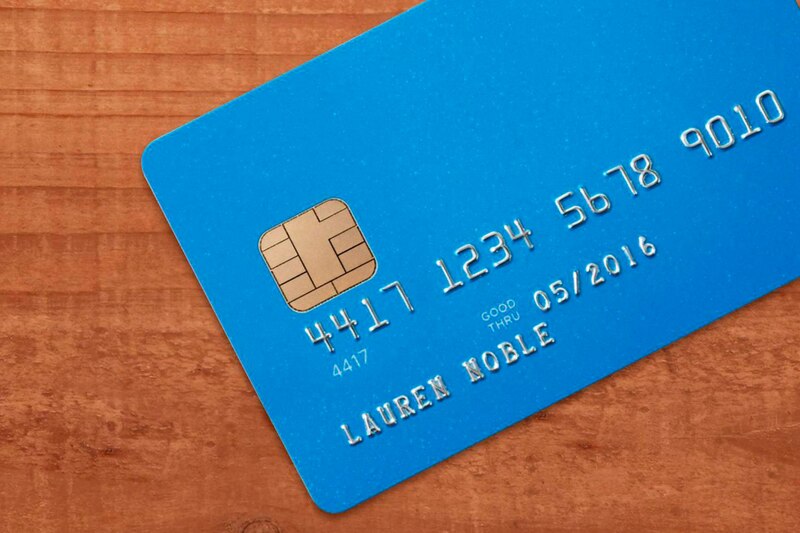 Whenever you are taking payment by credit card and the card isn’t present, there is some degree of risk. To safeguard against that risk — which includes chargebacks — you could ask your customer to sign a document that gives you permission to charge their card on an ongoing basis. That document is called a credit card authorization form. A credit card authorization form is a document, signed by a cardholder, that grants a merchant permission to charge their credit card for a period of time as written in that document. The form is often used to give businesses the ongoing authority to charge the cardholder on a recurring basis — whether that’s monthly, quarterly, or more sporadically. Do credit card authorization forms help prevent chargeback abuse? Chargebacks protect consumers from unauthorized transactions. They occur when a customer disputes a charge from your business and asks the card issuer to reverse it. But chargebacks can cause major issues for businesses, in large part because disputed funds are held from the business until the card issuer decides what to do. Chargebacks are also time consuming for businesses and involve a lot of paperwork. A credit card authorization form is one way to protect yourself against chargebacks. If you have a signed document from the cardholder that gives you permission to charge their card for services rendered, your chances of winning your case with the card issuer are much more likely and less complicated. Learn about other ways to protect your business from chargebacks. If I’m a Square seller, when should I use an authorization form? Credit card authorization forms are very useful for recurring transactions, whether those are recurring manually entered card-not-present transactions or recurring Card on File transactions. The form does two things: It mitigates the risk of customers saying they were charged when they shouldn’t have been, and it saves everyone a lot of time. Let’s say you are a restaurant that caters lunch for a local office every other week. If you have an authorization form on file, you know that every time that office calls for a delivery, you can charge it to their card. You don’t have to go back and forth on which form of payment they want to use or have them sign for the charge every time. But recurring billing isn’t the only situation where the authorization form comes in handy. You might also use a credit card authorization form to take a deposit for the future purchase of goods, services, or incidentals. This comes in handy if you run any type of business that rents expensive equipment. You can use a credit card authorization form to put a hold on a card until the equipment is returned. 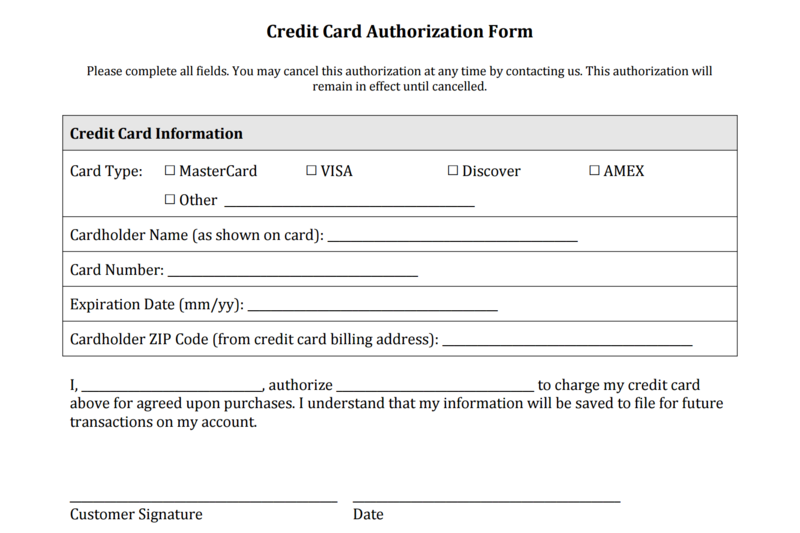 What is included in a credit card authorization form? Square offers two free generic credit card authorization forms for download. You do not have to process payments with Square to use these templates. You can use these forms as-is or edit them to include your business’s name and logo or specific language related to the use of the card. You may want to talk to your lawyer about the type of language that your business should include on the form. In addition to the card authorization template, we’ve create a suite of free contract templates that you can use for various aspects of your business. Am I legally obligated to use credit card authorization forms? Credit card authorization forms are a best practice for merchants. Although it’s not legally required, you should ask your lawyer when they would suggest using one. Why doesn’t this credit card authorization form have a space for CVV? It’s a violation of PCI standards to record a customer’s CVV, which is why there isn’t a space for it. If you’d like to manually input a payment, you’ll need to request the CVV directly from the seller each time you input the card. If you take advantage of Square’s Card on File feature, you don’t have to manually input the CVV. What is Card on File? It allows business owners — with permission from their customers — to securely store payment information with Square. This makes it easier to charge recurring customers online or in person through your POS, Square Invoices, or our eCommerce API. If you regularly bill customers remotely (by keying in card information), you can use Card on File to charge customers in the future without any additional action. How should I store signed forms and for how long? PCI compliance standards require that all businesses that process credit card information “restrict physical access to cardholder data.” Be sure to keep cardholder data safe by storing completed forms in a secure room or filing cabinet, and restrict access only to employees who require it to fulfill their job duties. Because chargeback windows can vary, we suggest storing all signed authorization forms for up to two to three months after you stop charging the card on file. Alternatively, if you use Square, you can store this card information through the Card on File feature (see above). What Is a Payment Gateway? And Do You Even Need One? What Is a Chargeback? And How Do You Prevent Them?